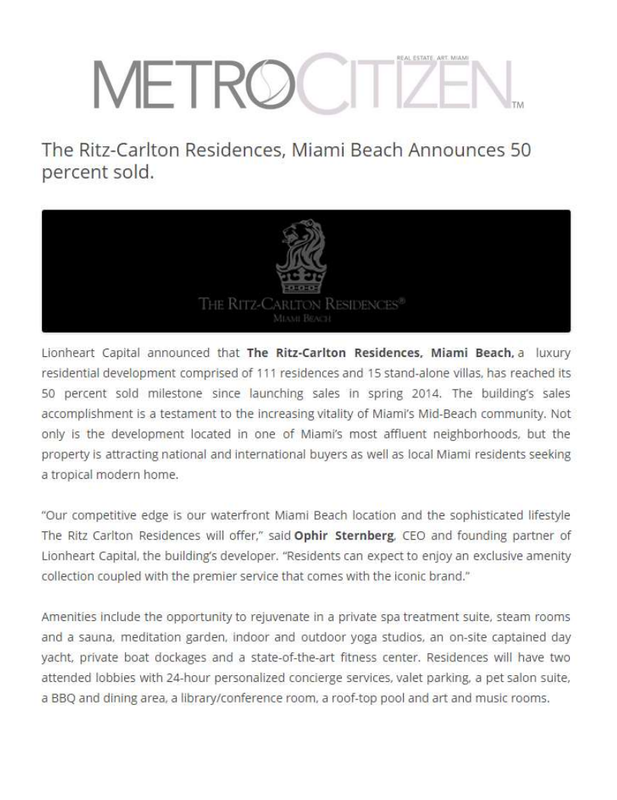 Lionheart Capital announced that The Ritz-Carlton Residences, Miami Beach, a luxury residential development comprised of 111 residences and 15 stand-alone villas, has reached its 50 percent sold milestone since launching sales in spring 2014. The building’s sales accomplishment is a testament to the increasing vitality of Miami’s Mid-Beach community. Not only is the development located in one of Miami’s most affluent neighborhoods, but the property is attracting national and international buyers as well as local Miami residents seeking a tropical modern home. Amenities include the opportunity to rejuvenate in a private spa treatment suite, steam rooms and a sauna, meditation garden, indoor and outdoor yoga studios, an on-site captained day yacht, private boat dockages and a state-of-the-art fitness center. Residences will have two attended lobbies with 24-hour personalized concierge services, valet parking, a pet salon suite, a BBQ and dining area, a library/conference room, a roof-top pool and art and music rooms. Located on seven acres in a quiet corner of Miami Beach on the shores of Surprise Lake and designed by renowned Italian architect Piero Lissoni, the project will bring together for the first time his modernist vision with the legendary service of The Ritz-Carlton. The upscale mid-rise residential development, Lissoni’s first full-scale architectural work in the US, is being completed with award-winning Miami architecture firm ADD Inc. The two- to five-bedroom homes range in size from 1,700 to over 11,000 square feet, in a selection of 60 unique floor plans, ranging in price from $2 million to $40 million. Each home will be equipped with a Piero Lissoni designed Boffi kitchen, oversized stone countertops, Gaggenau appliances and built-in coffee systems, along with equally impressive Boffi master his and her bathrooms featuring stone flooring, oversized glass-enclosed rain showers and jetted soaking tubs. Every residence will be wired for smart-home technology. Many homes will include private elevator foyers, sprawling terraces, summer kitchens and private plunge pools. Due to zoning restrictions, The Residences is the only project of this magnitude that can be built in this exclusive neighborhood. Just a short distance to the area’s top-tier schools and steps away from the prestigious Upper North Bay Road, residents can enjoy the famed shops of Lincoln Road, the Art Deco District of South Beach and the central business district of Downtown Miami/Brickell and then return to the comfort and quiet of their homes in mere minutes. The Residences are priced from $2 million to $40 million.